March 23, 2019 -- Los Angeles is often called a city of immigrants, and every ethnic, racial and geographic group seems to bring its own festivals and celebrations to the city – to remember a familiar experience from their home, and to share a part of their culture with their new neighbors. Mexican, Irish, German, Chinese, African-American, Italian, Greek, Cuban, Jewish, Japanese, Russian, Armenian, Puerto Rican and Vietnamese immigrants and their descendants – and many other nationalities – all have festive events throughout the year in the Los Angeles area to honor their nationalities and cultures, including St. Patrick’s Day, Oktoberfest, the Chinese New Year, Dia de los Muertos, and dozens more. 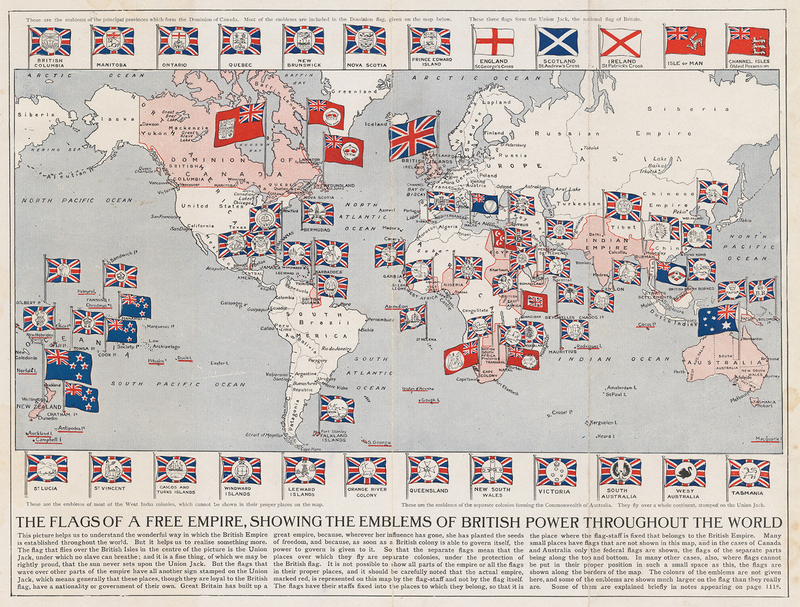 In the early 20th century, the citizens of Great Britain, and residents of the nations in the global British Commonwealth, including Canada, Australia, New Zealand, India and nations in Africa, South America and the Caribbean, brought Empire Day to Southern California. British citizens started celebrating Victoria Day in the late 19th century, in honor of the reigning Queen Victoria, and in celebration of the British Empire. The first celebrations took place on May 24, the queen’s birthday. When Queen Victoria died on Jan. 22, 1901, after a reign of more than 63 years, the name of the event was changed to Empire Day. 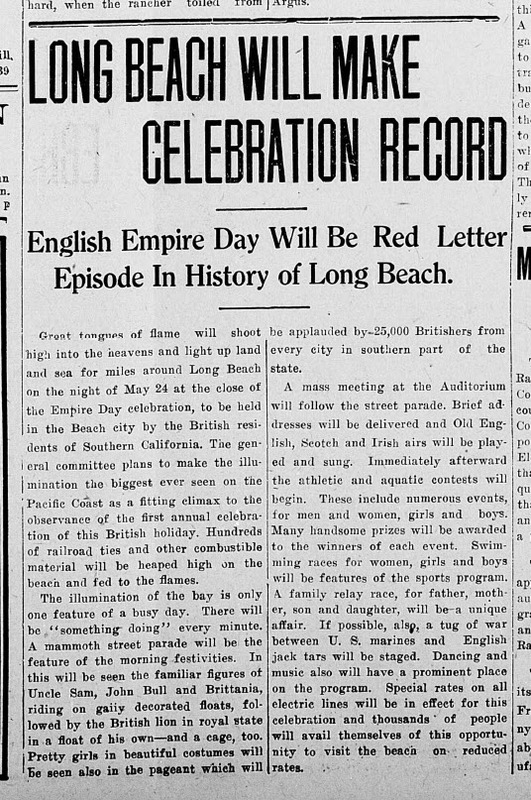 In 1913, British-born residents of Southern California, former residents of the British Commonwealth, and the descendants of Commonwealth natives planned a huge Empire Day festival and picnic in Long Beach, to be held in and around the Long Beach Municipal Auditorium, at Pine Avenue and Seaside Way. The auditorium opened in November 1905, at a cost of $38,000, and was built on pilings to extend out over the beach and the ocean. The wooden structure featured two floors, both surrounded by outdoor promenades. The main auditorium offered 40,000-square-feet of floor space, and a seating capacity of 6,000. The Long Beach Empire Day celebration was scheduled to start at 10:30 a.m. on Saturday, May 24, with a parade of automobiles and floats containing representatives of the nations of the British Commonwealth. At 11 a.m., a program of speakers and music would be held at the auditorium, followed by lunch (with free tea) on the picnic grounds. In the afternoon, a variety of athletic competitions was scheduled, including swimming, diving and foot races for men, women and children – with some competitions limited to British citizens. In the evening, a massive beach bonfire was planned with the burning of stacks of railroad ties, touted as the largest bonfire ever seen on the Pacific coast. To accommodate the anticipated crowds, the Pacific Electric Railway scheduled special trains to Long Beach, with the first leaving Los Angeles at 9 a.m. A special train was also scheduled to bring dignitaries and revelers from San Bernardino. It was a warm, sunny Saturday in Long Beach, and an estimated 25,000 people – more than the entire population of the city – were gathered for the Empire Day celebration. After the morning parade, the revelers headed to the auditorium to hear the program of speakers and music. Hundreds of people were standing on the outside promenade decks on both levels of the auditorium, waiting for the doors to open. Many of the people at the auditorium were older, and weren’t able to make it out to see the parade, but they wanted to be among the first in line to see the program. There was a slight delay as dignitaries from the parade were allowed to enter the auditorium first. When the auditorium doors finally opened at about 11:30 a.m., about 30 minutes behind schedule, the crowd pushed toward the entrances. As the throng crowded around the doors, one of the wooden supports beneath the second-floor deck splintered under the extreme weight. A section of the wooden deck, about 42-feet-by-26-feet, broke away and fell 20 feet down to the first level, bringing hundreds of people down with it. Due to the impact and additional weight of the upper floor, a smaller section of the first-level deck also broke away and fell an additional 10 feet down onto the beach. “The floor slipped from under their feet with the suddenness of a trap on a hangman’s scaffold,” the New York Times reported. Because of the configuration of the collapse, people on both levels fell or slid toward the center of the void, into a funnel of jagged timbers, creating a concentrated pile of bodies upon bodies on the beach. Thirty-four people died at the scene. A few died as a result of the fall, or injuries received from the splintered and falling lumber, but most were suffocated on the beach under the weight of the bodies and timber on top of them. Four more victims later died of their injuries, bringing the final death toll to 38. More than 300 people were injured. Had the tide not been out at the time, it’s likely the death toll would have been higher due to drownings. The 38 victims included 30 women, four men and four children. Nearly one-third of the fatalities were women in their 60s and 70s. Police officers, firefighters, doctors, nurses and volunteers rushed to the scene. As bodies were pulled from the rubble, a makeshift morgue was set up on the beach. The bodies were later taken to the National Guard armory and area funeral parlors for identification. Nearly all of the victims were former residents of the British Commonwealth, or descendants of British immigrants. The injured were rushed to Seaside Hospital and the Long Beach Sanatorium, and to hospitals in Los Angeles, with many transported by the same cars which carried smiling and waving dignitaries in the morning parade. About 25 were treated in nearby homes. After the deck collapse at the auditorium, the city of Long Beach immediately tried to do everything possible to help the victims and their families. Long Beach Mayor Ira S. Hatch announced that the city would pay all funeral costs for the dead, and all medical expenses for the injured. Physicians and nurses from Long Beach and Los Angeles volunteered their time and skills. A Citizens’ Relief Committee was formed the day after the tragedy, to organize fund-raising efforts and provide assistance to the victims and their families, and banks and businessmen immediately offered donations. The Sunset Telephone Company offered free long-distance telephone service to the families of the dead and injured, and the Pacific Electric Railway offered free transportation for medical personnel to and from Long Beach, and for injured residents returning home to Los Angeles. The Long Beach Board of Public Works ordered that roses be cut each morning in Bixby and Pacific parks, and delivered to funeral homes, hospitals and homes of the injured. Flags on municipal buildings in Long Beach and Los Angeles were ordered flown at half-mast. On many buildings and homes, the British flag flew along with the U.S. flag. To raise funds to assist the victims and their families, and also prepare for an anticipated $1 million in lawsuits, the city of Long Beach proposed a $60,000 bond issue, which was overwhelmingly approved by voters in June 1913. The city and its residents were widely praised for their unwavering assistance and support for the dead and injured. But the city's full and complete support changed once the lawsuits started. Edith Emma Bernhardt Chafor, 29, 1315 W. Jefferson Blvd., Los Angeles. Edith Bernhardt was born in 1884, of French ancestry, in Shannonville, Ontario, Canada, about 125 miles northeast of Toronto. On April 24, 1913, 29-year-old Edith, her husband, George Chafor, 39, and their 7-year-old son, Edward, made their first visit to the United States, arriving at Port Huron, Michigan, along with George’s brother, Clayton, 21. George Chafor was born in St. Catharines, Ontario, Canada, just a few miles from the U.S. border, near Niagara Falls. The group’s final destination was Los Angeles, where George, a barber, hoped to find work. As Canadian citizens, and members of the British Empire, the Chafor family attended the Empire Day festivities in Long Beach. Edith was killed in the auditorium collapse, exactly one month after her arrival in the United States. George and Edward were not injured. Edith’s body was returned to her hometown of Shannonville for burial. George remained in Los Angeles, working as a barber, until his death in 1956, at the age of 82. George was cremated and his remains are in the Utility Columbarium at Forest Lawn Memorial-Park in Glendale. Twelve-year-old Margaret Reed of Long Beach went to the Empire Day festivities with her mother, Vina, 36, and her younger sister, Ruth, 10. The family moved to Long Beach from San Bernardino County two months earlier, and they were standing together on the outside auditorium deck when it collapsed. Margaret suffered a concussion, broken back, spinal injuries and several broken ribs, and was taken to Long Beach Sanatorium. Vina Reed was taken to Seaside Hospital, suffering from a dislocated right shoulder and a broken arm which required surgery. Ruth was not injured in the fall. Margaret never regained consciousness. 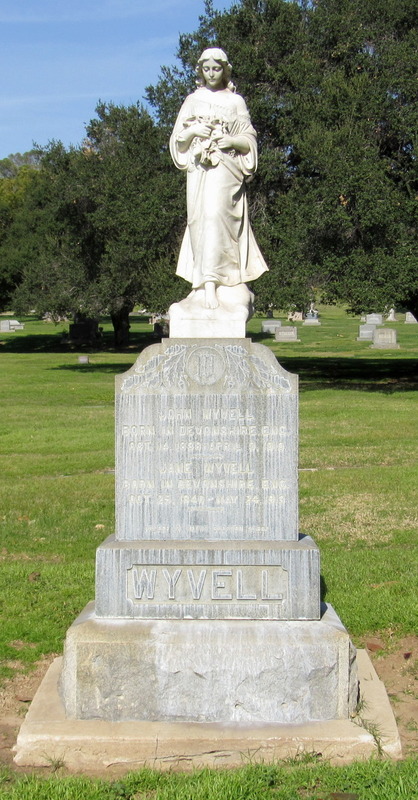 She developed spinal meningitis and died six days later, on May 30, 1913. Vina recovered from her injuries. It’s not known if Isaac Reed was prospecting for gold in Arizona, but that’s not why he didn’t come back to Long Beach after his daughter’s death. And he definitely didn’t want to be found. Isaac Reed was born in Missouri in May 1867, and came to California in about 1890, settling in the tiny desert mining town of Dale, just north of Joshua Tree National Park in San Bernardino County. Reed held a variety of jobs over the next 10 years, including farmer, miner and operating a candy store in Dale. In May 1896, he enlisted in the California National Guard, and was honorably discharged five months later. After he married Vina Reed of San Bernardino on July 4, 1900, Reed seemed to settle down. During the next 10 years, he opened a general merchandise store in Dale, served as Justice of the Peace, and was appointed Postmaster for the tiny community in May 1909. During his tenure as Postmaster, Reed was suspected of stealing $1,072 in money order transfers to cover his gambling debts. (Due to its remote location, many residents of Dale used money orders to send or receive money.) In early March 1913, worried that postal inspectors might be closing in on him, Reed sent his wife and two young daughters to Long Beach, telling them he was going to either Arizona or Mexico to make enough money to pay off his debts. He didn’t tell them the reason for the debts, or when or if he would return. Investigators didn’t believe that Vina Reed knew anything about her husband’s embezzlement. 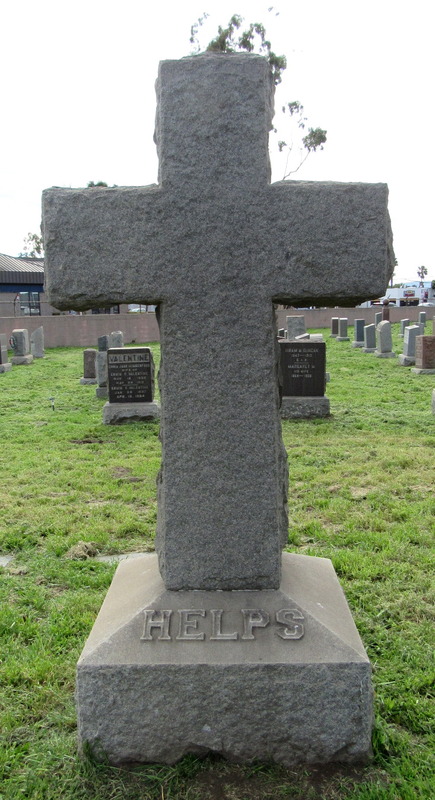 Margaret Reed’s funeral service was held on June 4, 1913, with burial at Sunnyside Cemetery in Long Beach. A postal inspector from Los Angeles secretly attended the services, hoping to arrest Isaac Reed, but Reed didn’t show up. Vina Reed and her surviving daughter remained in Long Beach, then moved back to San Bernardino in about 1930, where Vina worked at home as a seamstress. Although her husband was never found, Vina referred to herself as a widow. 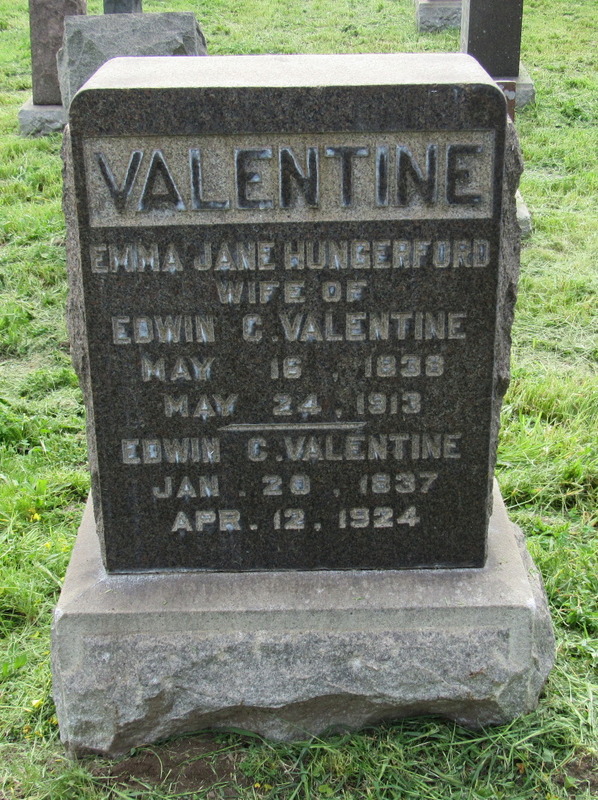 Vina died Nov. 17, 1970, at the age of 93, and is buried with her parents at Pioneer Memorial Cemetery in San Bernardino. Issac Reed's fate remains unknown. Ernest Eales, and his wife, Annie Lang Eales, both immigrants from England, made the trip from their home in Los Angeles to attend the Empire Day festivities in Long Beach. Ernest was born in May 1866 and came to the United States in 1883, when he was 17 years old. Annie was born in March 1864 and came to the United States in 1887, when she was 23. The couple married in New York City on July 18, 1887, shortly after Annie’s arrival. The newly married couple moved first to Denver, Colorado, where Ernest worked as a railway car inspector, and became a naturalized U.S. citizen. The couple’s first child, Harold, was born in September 1892, followed by Florence, born in August 1896. In 1903, the family moved to Los Angeles, where they lived at 217 N. Hancock St., in the Montecito Heights neighborhood in the northeastern part of the city. By 1913, the family was living at 116 W. Avenue 45. Ernest was working as a car inspector for the Atchison, Topeka and Santa Fe Railway, Harold was working for the L.A. Gas and Electric Co., and Florence was a student at Polytechnic High School, where she was president of the Girls’ Committee. Ernest and Annie Eales went alone to Long Beach for the Empire Day event, leaving their children at home. When their parents didn’t return home Saturday evening, Harold and Florence went to Long Beach to look for them. They found and identified their bodies at a funeral parlor. 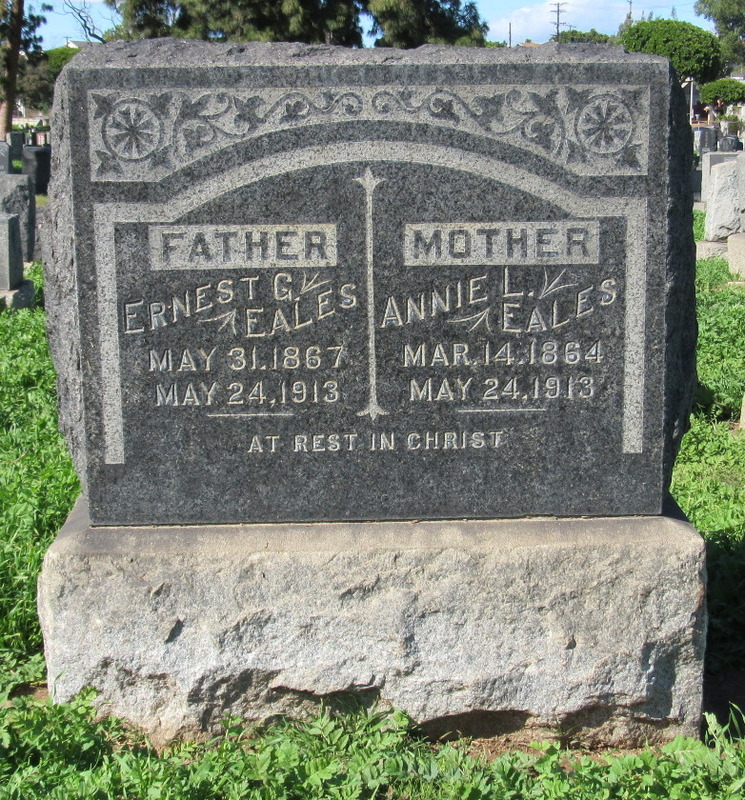 Ernest and Annie Eales are buried together at Evergreen Cemetery in Los Angeles. Fannie McGehee was born and raised in Tennessee, the daughter of English immigrants, and worked as an English teacher and head of a girls’ school. Fannie and her husband, Louis, had two children – Edward, born in 1856, and Kate, born in 1858. In 1901, after the death of her husband, Fannie moved to San Bernardino, California, and lived with her daughter, Kate; Kate’s husband, Milton A. Pace; and their two children, John and George. Milton Pace was a partner in the Harrison & Pace grocery store in San Bernardino. While in San Bernardino, Fannie became an active member of several social groups, including the Ladies Guild of St. John’s Episcopal Church, the San Bernardino Woman’s Club, and the local chapter of the United Daughters of the Confederacy. At various times, Fannie served as president of all three organizations. Fannie was well-known for presenting educational and entertainment programs to her own organizations, and to other civic groups throughout the community. In the summer of 1912, Milton and Kate Pace and their two children moved to Long Beach, and Fannie, who was in fragile health, moved with them, to a house at 114 E. Seventh St. Fannie, 74, and Kate, 58, attended the Empire Day festivities together in Long Beach. 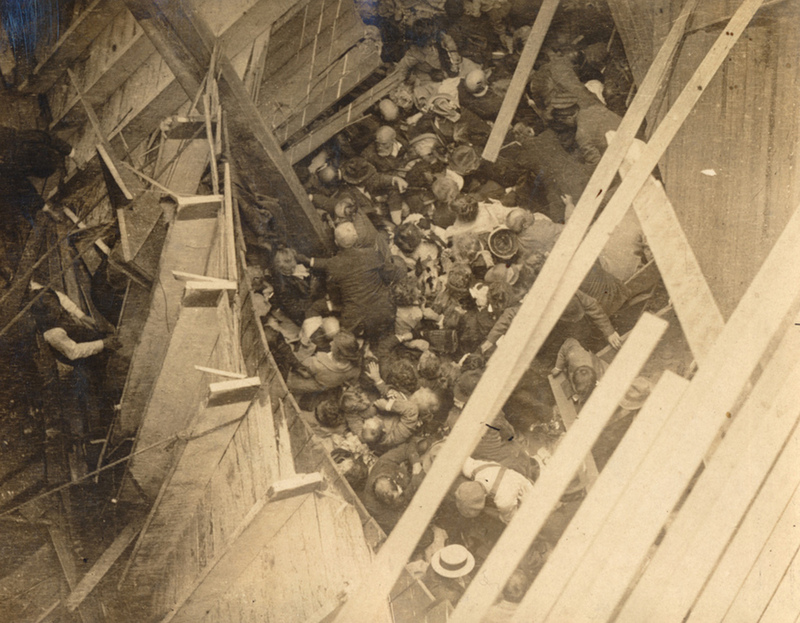 Fannie died in the auditorium floor collapse, and Kate was seriously injured, suffering broken ribs and other injuries. When Kate was pulled from the wreckage, despite her injuries, she was somehow able to walk nearly a half-mile to her home on Seventh Street. She was helped into the house by neighbors and fainted, not regaining consciousness until the next day. For Kate Pace, the death of her mother was the first in a series of family tragedies. Her son, John, died in 1915, at the age of 31; her husband, Milton, died in 1918, at the age of 62; and her granddaughter, Mildred, who was born the year after the auditorium collapse, died in 1920, at the age of 6. Kate Pace died in October 1951, at the age of 96. 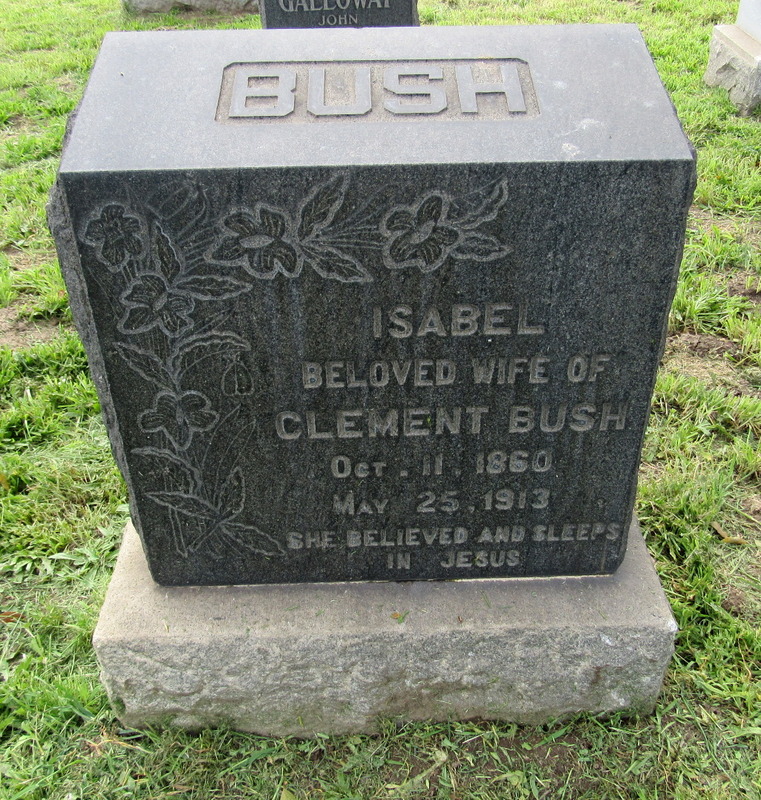 She’s buried at Inglewood Park Cemetery, along with her husband, sons, and granddaughter. Warren C. Lett and Alice Darling, both 29 years old, were married on May 31, 1899, in Evansville, Indiana. Two years later, in April 1901, they became the parents of twins, Dalmer and Dorothy. A third child, Harold, was born in March 1906. Shortly after Harold’s birth, the family moved to Long Beach, where Warren held an assortment of jobs, including driver for a cold storage company, and conductor for the Pacific Electric Railway. On Empire Day 1913, Alice took two of the children, 12-year-old Dorothy and 7-year-old Harold, to the festivities at the Long Beach Auditorium, while Warren and Dalmer remained at home. Alice’s mother was an immigrant from Scotland, so perhaps she felt a kinship to the British Empire. 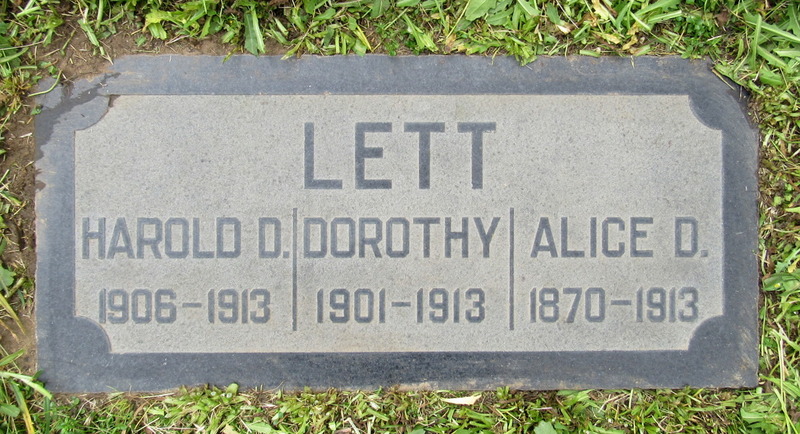 Alice, Dorothy and Harold Lett all died in the auditorium deck collapse – the largest loss of life from a single family. Funeral services were held the following Saturday and, according to the Los Angeles Herald, “No other funeral can be held at that time, as all the hearses in Long Beach are needed by the grief-stricken Lett family.” The Letts are buried together at Sunnyside Cemetery in Long Beach. Warren Lett and his surviving child, Dalmer, returned to Indiana, where Warren married Mary McCarley, on March 9, 1918. Dalmer Lett joined the U.S. Navy, where he rose to the rank of Lieutenant Commander. Warren Lett died on July 21, 1951, at the age of 81, and is buried at Rose Hills Cemetery in Newburgh, Indiana. Lt. Cmdr. Dalmer Darling Lett died in Florida in January 1962, at the age of 60. Alexis Caroline Sadler and Richard George Dowle were both born in Kent, England, in the southeastern part of the country, not far from the English Channel. They were married in Kent, and their son, Wilfred, was born there in 1891, followed by two daughters – Cecilia, born in 1894, and Edith, born in 1895. In March 1909, the Dowle family arrived in the United States, crossing from Canada into Port Huron, Michigan, on the Grand Trunk Railway. The following year, the family was living in on East 11th Street in Los Angeles. Richard was working as a conductor for the Pacific Electric Railway, and son Wilfred was a driver for Superior Dairy. 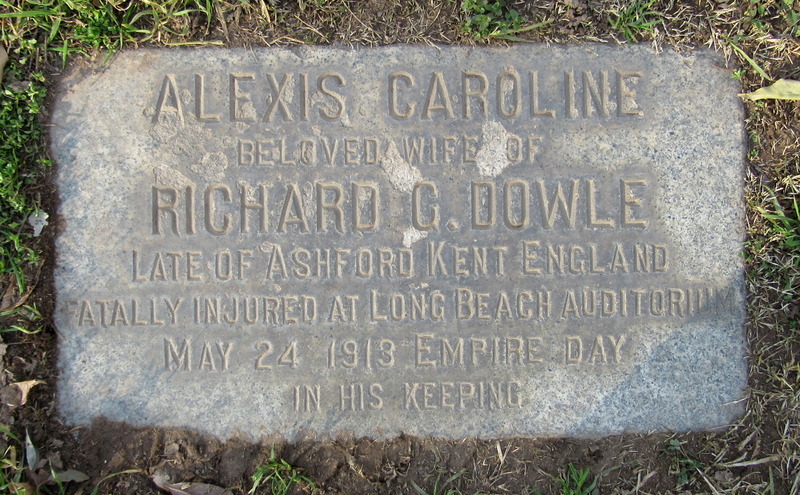 By 1913, the family was living in Pasadena, and Richard and Alexis went to attend the Empire Day festivities in Long Beach. They were standing together when the deck collapsed. Richard said they fell together, arm in arm. Richard Dowle recovered from his injuries, and continued to work for the railroad, and later as a machinist, rancher, maintenance man and gardener. After his wife’s death, he married twice more. 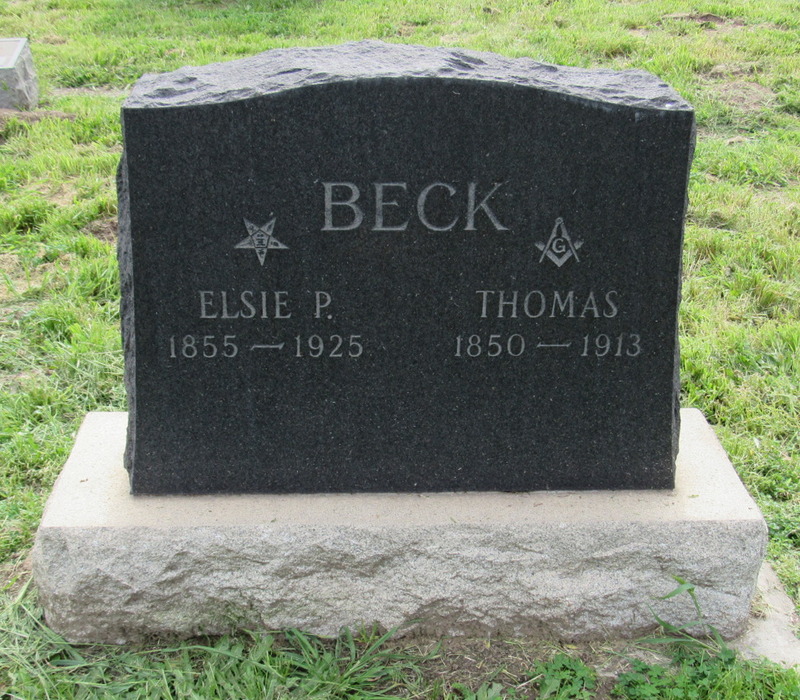 He died on April 5, 1959, about two weeks before his 86th birthday, and is buried next to his first wife. Virgil Bayless was born March 19, 1909, in Melvern, in eastern Kansas, about 40 miles south of Topeka, the first child of Henry, a farmer, and Irene Bayless. The couple’s second son, Ira Murlin Bayless, was born Sept. 18, 1912. In early 1913, the family moved to Long Beach, where Henry found work at the A.B. Snow Lumber Company, and the family lived at 2103 Pasadena Ave. The Bayless family attended the Empire Day event – Irene’s parents were both immigrants from Ireland – and all four were standing on the auditorium deck when it collapsed. Virgil was killed, Henry and Irene were seriously injured, but Ira escaped unharmed. Four-year-old Virgil was the youngest victim of the tragedy. Virgil’s body was sent back to Kansas for burial in the family plot in Melvern Cemetery. His parents were unable to attend the service, as they remained hospitalized in Long Beach. 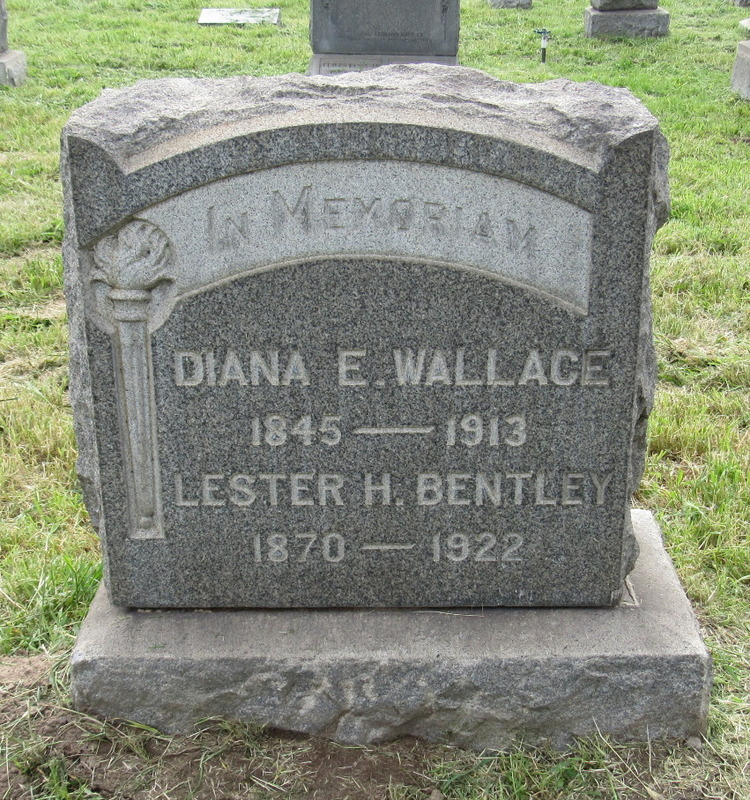 Henry and Irene Bayless survived their injuries, and remained in Long Beach. Henry died following a stroke in April 1954, at the age of 80. Irene died two years later, in June 1956, from heart disease, at the age of 77. They’re buried with their first-born son in Melvern Cemetery. Ira Bayless died in October 1997, at the age of 85. He was cremated, and his ashes were scattered in the Pacific Ocean off the coast of Long Beach. • Bertha A. Bartz, 52, Long Beach; burial unknown. • Thomas Beck, 63, Long Beach; buried at Sunnyside Cemetery, Long Beach. 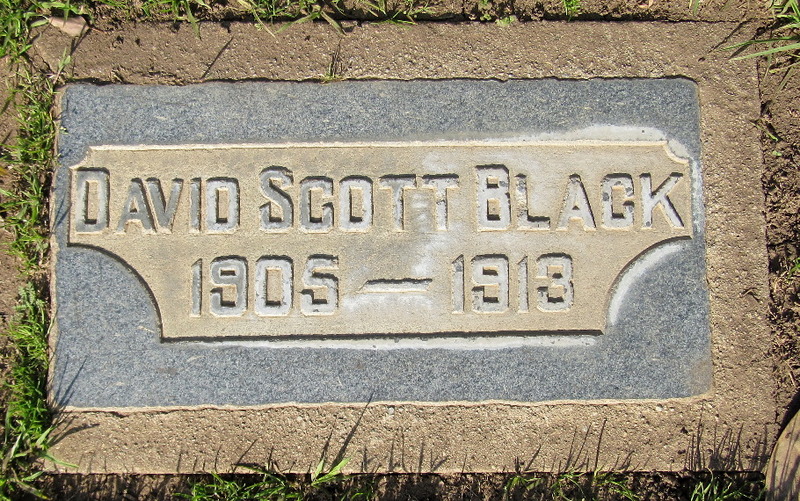 • David Scott Black, 7, Glendale, California; buried at Forest Lawn, Glendale. • Martha J. Burnette, 68, Long Beach; burial unknown. •	Isabelle Burley Bush, 52, Long Beach; buried at Sunnyside Cemetery, Long Beach. •	Sarah Jane Palmer Cheshire, 56, Los Angeles; burial unknown. •	Mary Eliza Ferris Gates, 59, Sierra Madre, California; buried in Milton, Wisconsin. •	Ada Mary Humphreys Helps, 45, Long Beach; buried at Sunnyside Cemetery, Long Beach. •	Amanda M. Hill, 75, Orange, California; buried at Fairhaven Memorial Park, Santa Ana, California. •	Lillie M. Holme, 45, Long Beach; buried in Denver, Colorado. •	Clarissa M. Hoskins, 75, Pasadena, California; buried in New Orleans, Louisiana. 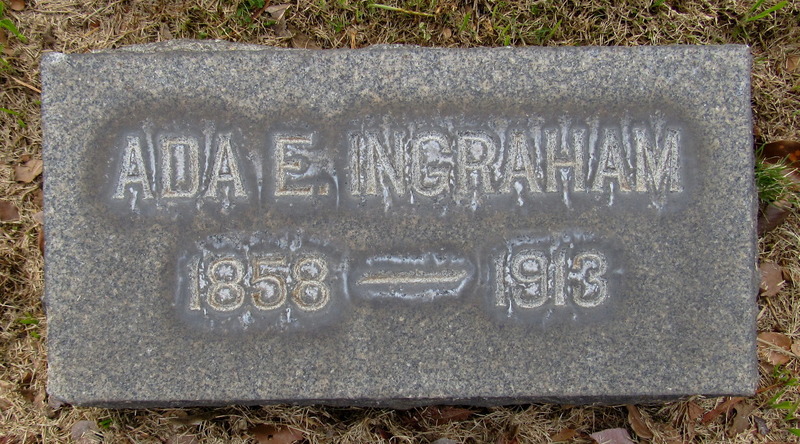 •	Ada E. Ingraham, 54, Pasadena, California; buried at Mountain View Cemetery, Altadena, California. •	Rev. Dr. Ira B. Kilborne, 84, Smithland, Iowa, buried in Smithland, Iowa. •	Mary Jarvis Lawrence, 56, Los Angeles, buried at Evergreen Cemetery, Los Angeles (unmarked). •	Annie Harmon Longfellow, 47, Pasadena, California; buried at San Gabriel Cemetery, San Gabriel, California. •	Malinda MacDonald, 57, Compton, California; buried at Woodlawn Memorial Park, Compton, California. 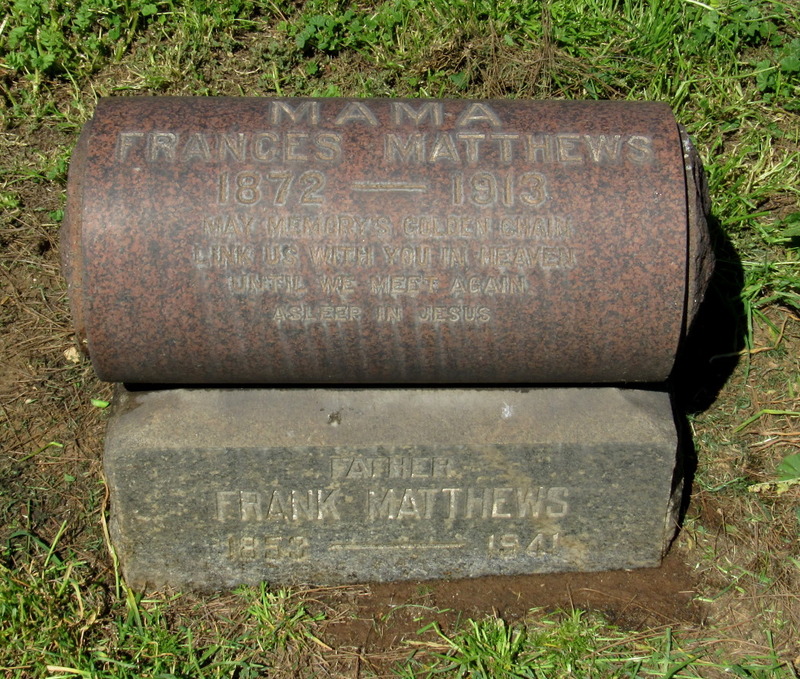 •	Frances Amelia Matthews, 41, Los Angeles; buried at Evergreen Cemetery, Los Angeles. •	Eliza Cochran McSparron, 71, Long Beach, buried in Traill County, North Dakota. •	Frances Harriet Newell, 66, Beverly Hills, California; buried in Kenosha, Wisconsin. 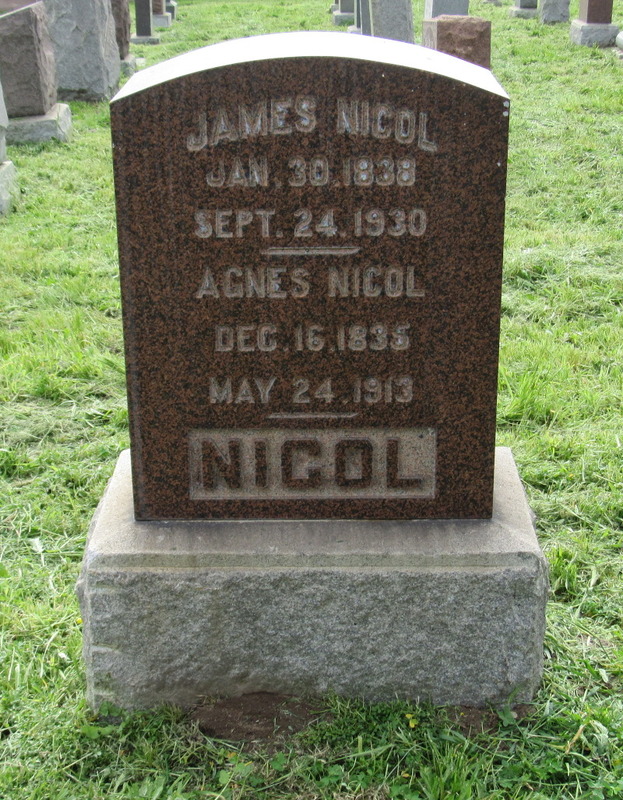 •	Agnes Nicol, 76, Long Beach; buried at Sunnyside Cemetery, Long Beach. •	Emma Hicklin Prigmore, 56, Long Beach, buried in Sweet Springs, Missouri. •	Elizabeth Hannah Richardson, 38, Orange, California; buried at Fairhaven Memorial Park, Santa Ana, California. •	Hannah Shaw, 59, Los Angeles; buried in Bellingham, Washington. 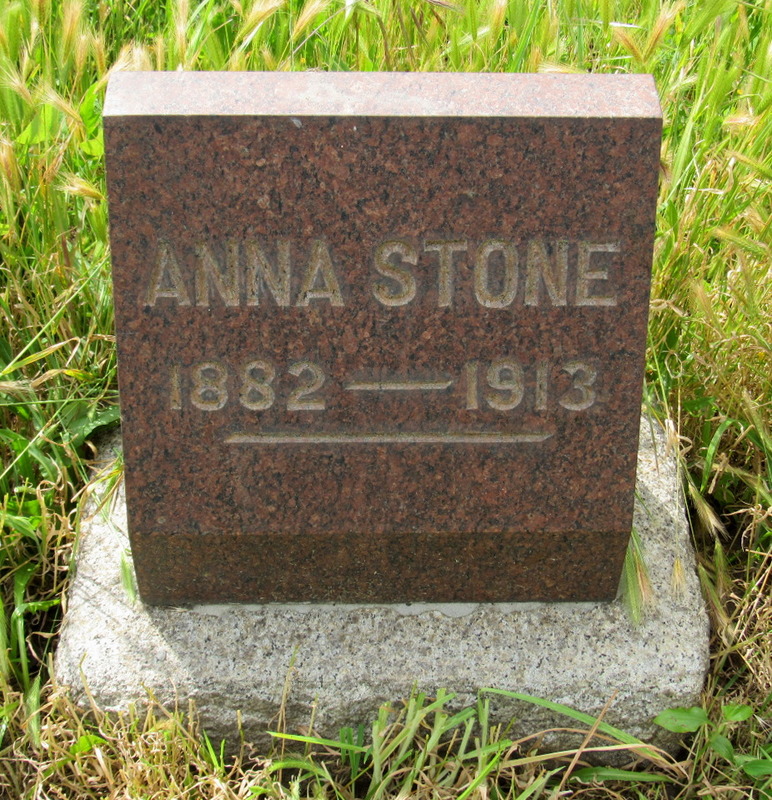 •	Anna Stone, 31, Long Beach; buried at Sunnyside Cemetery, Long Beach. 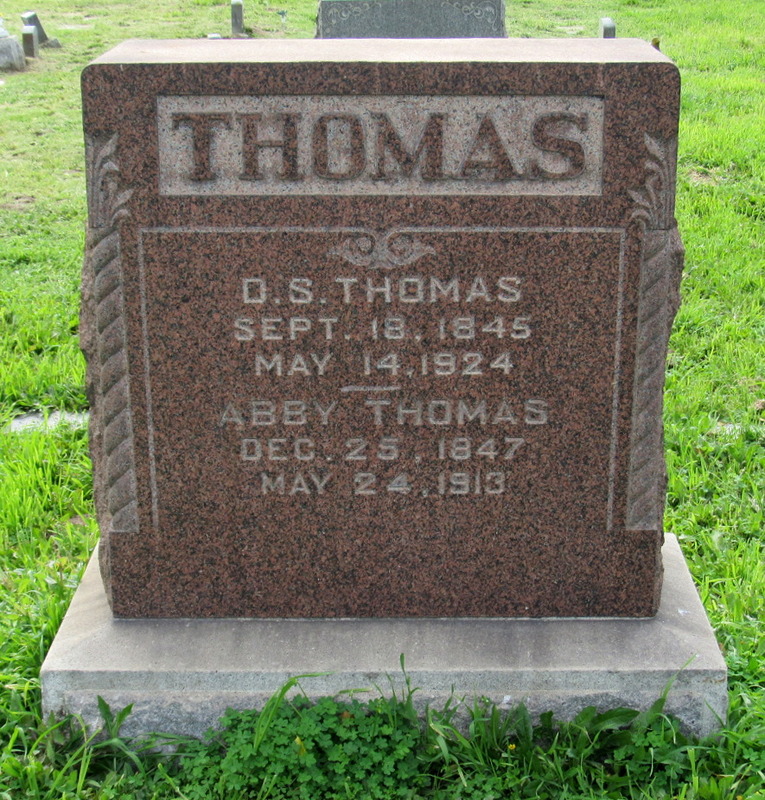 •	Abby Thomas, 65, Long Beach; buried at Sunnyside Cemetery, Long Beach. •	Emma Jane Hungerford Valentine, 75, Long Beach; buried at Sunnyside Cemetery, Long Beach. •	Diana E. Wallace, 67, Long Beach; buried at Sunnyside Cemetery, Long Beach. •	Jane Peardon Wyvell, 72, Burbank, California; buried at Forest Lawn, Glendale. Los Angeles City Councilman John Topham, an immigrant from England, was attending the Empire Day celebration, and was standing near the auditorium deck when it collapsed. “I was just coming in from the end of the pier and was only five feet from the bridge connecting the pier and the auditorium when the floor in front of me gave way," Topham told the New York Times. “In my judgement it was a death-trap. The pier was absolutely rotten and the door to the auditorium from the pier was closed and locked. An enormous crowd of people stood on the bridge in front of that door waiting for it to open when the pier fell. How anybody escaped death will always be a marvel to me." There were disputed reports that the people on the second level were marching in place to the patriotic music being played by a group of bagpipers entering the auditorium, and the rhythmic vibration contributed to the failure of the support pillar. “No recommendations were made as to whether the timber should be prosecuted,” the Times noted sardonically. 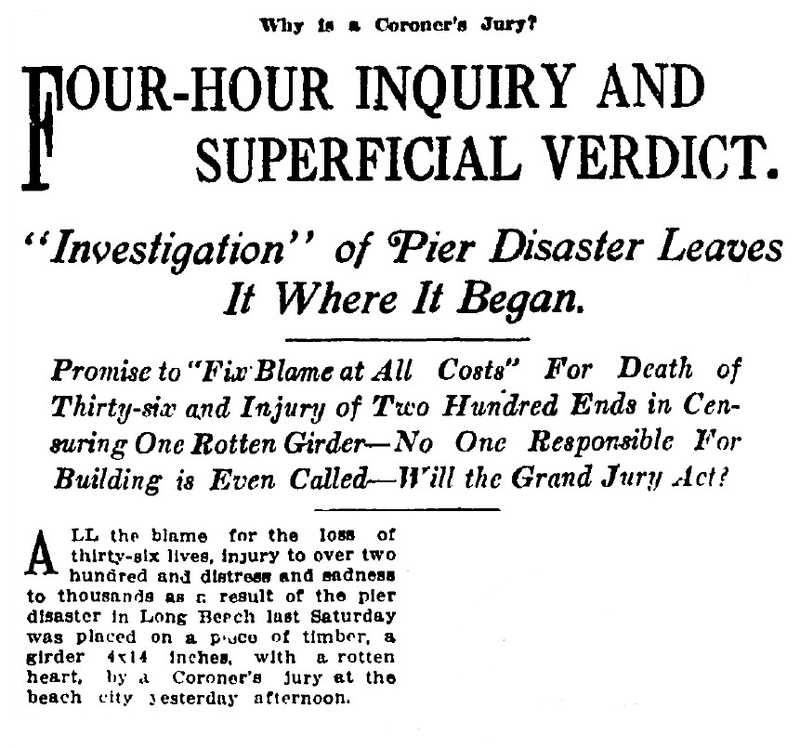 The county grand jury, under the direction of Los Angeles County District Attorney John D. Fredericks, issued its findings in October 1913, after about five months of investigation, and agreed with the coroner’s jury that the disaster was an accident caused by the failure of a rotten girder, and did not assess blame to any individual or city department. The Long Beach City Council directed the city’s Board of Public Works to examine the building. The board recommended that it be torn down. The Council then appointed a panel of three local architects to look at the structure. They also recommended demolition. A second three-member panel reached the same conclusion. The Council ignored them all. Meanwhile, a group of Long Beach residents submitted a petition to the City Council containing several thousand signatures, asking that the auditorium building be saved. The City Council agreed, with the sentiment that the abandonment or demolition of the structure would be considered an admission that it was unsafe. By May 24, 1914 – the first anniversary of the disaster and the deadline for filing claims – the city had received claims from more than 200 of those injured and family members of the dead, demanding more than $3.75 million (nearly $95 million today). The city’s defense was that it did everything possible for the 38 victims, the injured and their families, at considerable expense, and that two independent investigations concluded that there was no official responsibility for a tragic and unforeseen accident. 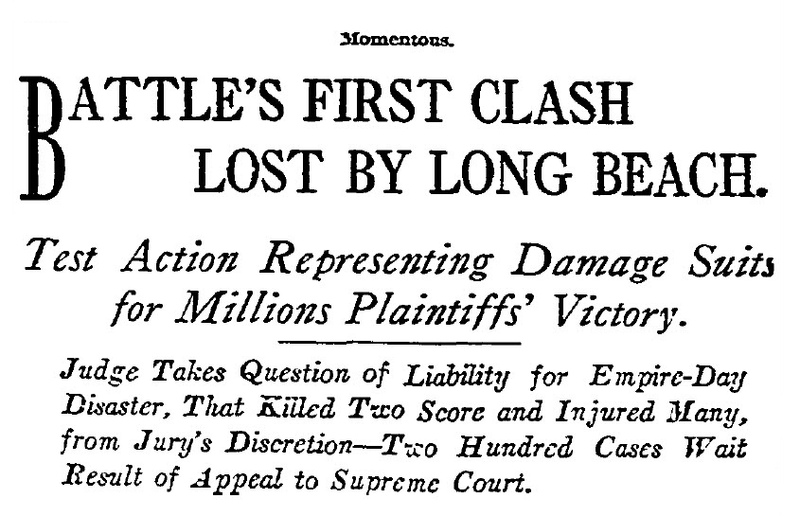 “Even a fraction of the aggregate claims, if granted, would be a staggering blow to Long Beach,” the L.A. Times reported. “Should the city itself be held liable, every bit of property in the beach city would have to bear its share of the cost, through taxation.” The first court case to be heard, which would likely be the test case for all to follow, was the case of George and Edward Chafor against the city, for the death of their wife and mother, Edith, requesting $15,500. 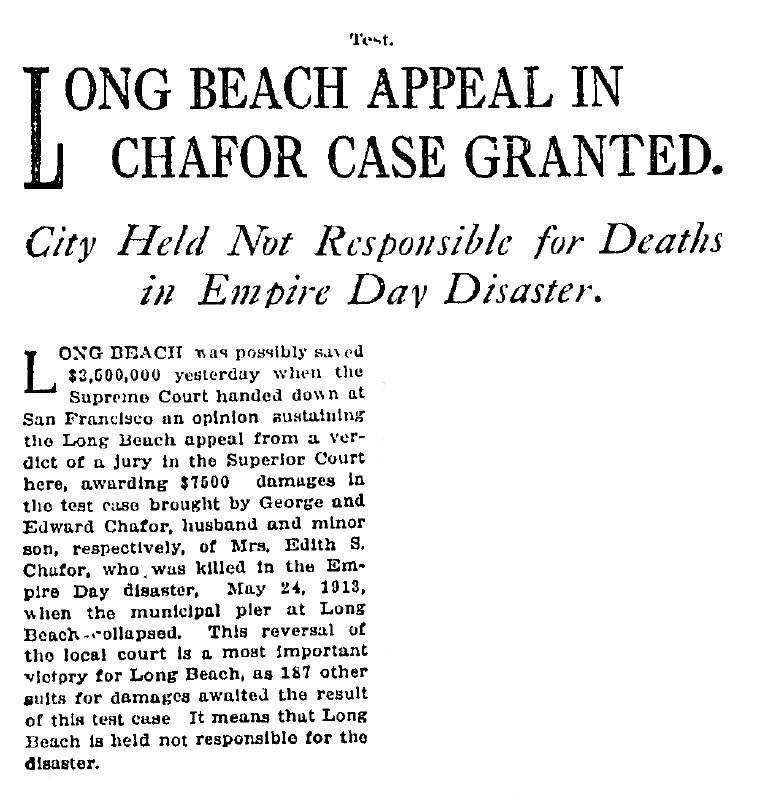 The jurors in the Chafor case were told that they did not need to decide whether the city, any city department or any individual was responsible for the Empire Day tragedy, but only how much George and Edward Chafor were entitled to as compensation for their loss. After three weeks of testimony and deliberations, the jury sided with the Chafors, and set damages at $7,500. The city immediately announced its intention to file an appeal with the California Supreme Court. 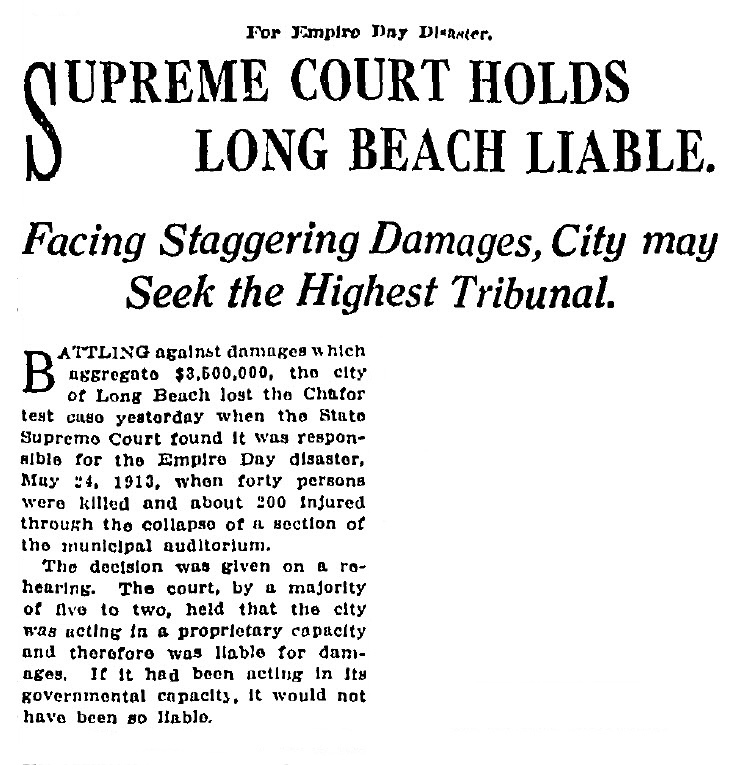 In May 1916, two years after the collapse, the state Supreme Court reversed the decision of the Superior Court jury, and ruled that the city of Long Beach was not responsible for the disaster, and should not have to pay damages. Attorneys for the Chafors filed a petition for a rehearing. This time, in March 1917, on a 5-2 vote, the state Supreme Court reversed itself and sided with the plaintiffs, ruling that, in the Empire Day situation, the city was acting in a private capacity by renting the auditorium, rather than in a governmental capacity as owners of the municipal property. Long Beach city attorneys considered taking the case to the U.S. Supreme Court, suggesting that since the auditorium stretched out over the ocean, it was under the control and jurisdiction of the federal government. By August 1917, the city had reached settlements on 52 of the lawsuits, for claims of nearly $1.3 million, with agreements totaling slightly more than $100,000. Less than a year later, all but one of the claims were settled for a total of $372,162 – about 10 percent of the initial claims – without any additional legal action. The last claim, by Walter and Amba Hadley of Redlands, who were both severely injured in the collapse, was settled in late December 1919. Amba Hadley received $1,500, and Walter Hadley received $300. The total payment to the Hadleys, with interest, was $2,053.37. 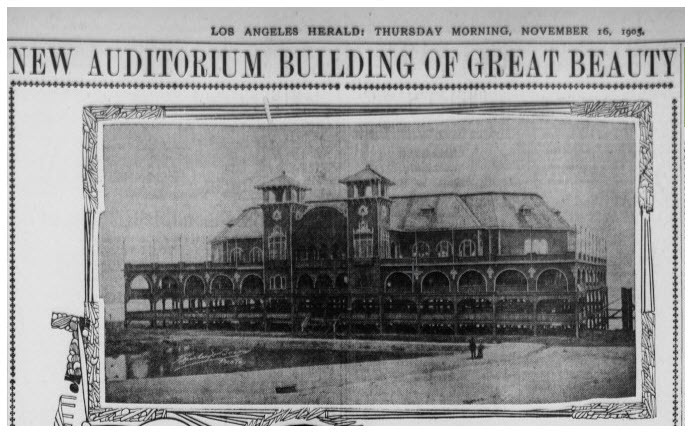 While the court cases and settlements continued, the Long Beach Auditorium remained open – despite the recommendations by the grand jury, the city’s Board of Public Works and two separate committees of experts that it was unsafe and should be torn town. In October 1914, inspectors and carpenters under the direction of the city’s Board of Public Works began a project to repair and reinforce the structure. The initial estimated $7,500 cost of the project increased when inspectors discovered more rotted timbers, including the main pilings supporting the building. Although the total cost of the repairs was estimated at more than the original $38,000 cost of the auditorium building, the repair project continued. Except for a brief period of repairs, the auditorium building remained open, and hosted a variety of events, including concerts, plays, films, dinners, art exhibitions, municipal club meetings, dances, flower shows, community meetings, a speech by William Jennings Bryan, and a campaign rally by California Gov. Hiram Johnson. 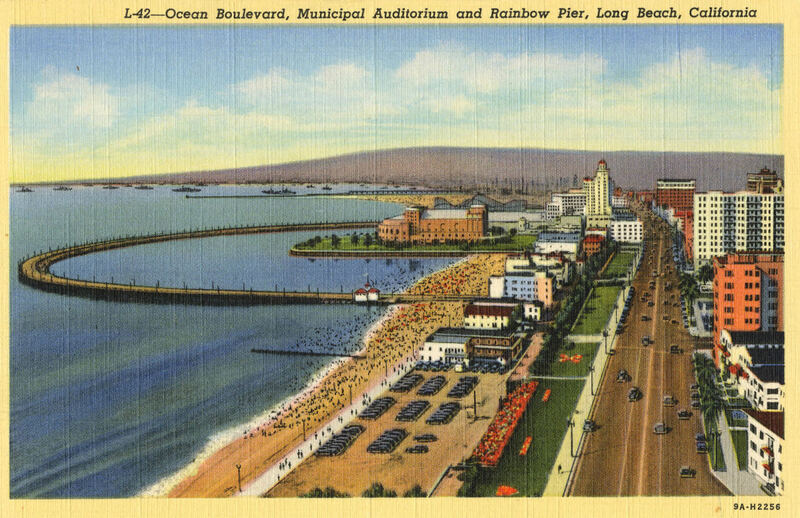 In 1932, the second Long Beach Municipal Auditorium opened, just east of the original, with seating for 8,000. Nearly 20 years after the original recommendation for demolition, the original auditorium building was torn down. To protect the new auditorium building from storms and coastal erosion, a horseshoe-shaped breakwater known as the Rainbow Pier was built around it, extending from Pine Avenue to Linden Avenue, and more than a half-mile out into the ocean. The breakwater, built with granite boulders and topped by a roadway, created the 40-acre Rainbow Lagoon, which attracted swimmers and boaters to its calm waters. The city filled in the Rainbow Lagoon in the 1940s, and continued to extend the coastline out into the ocean. 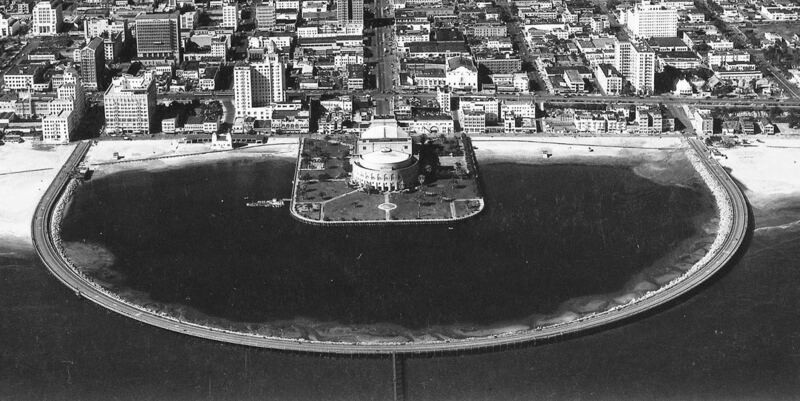 The second Long Beach Municipal Auditorium was torn down in 1975 and replaced by the Long Beach Convention and Entertainment Center, which currently occupies the former location of the Rainbow Lagoon. The seaside location of the original auditorium, at Pine Avenue and Seaside Way, is now several hundred feet from the water.